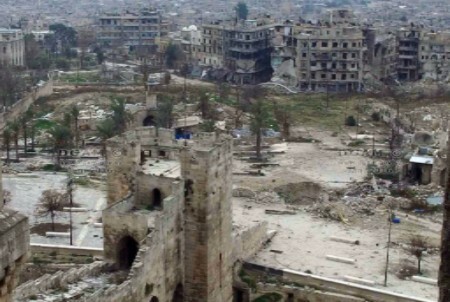 New photos sand videos how the state of World Heritage Sites and cities in Syria. Chair of Heritage for Peace, Isber Sabrine, presented on the destruction of Syria’s heritage at the conference Rettung historischer Kulturgüter vor Krieg und Zerstörung: Vom Zweiten Weltkrieg bis Syrien (Rescue of historical cultural assets against war and destruction: From World War II to Syria) in December. This presentation, and the work of the NGO, were featured on “The Art Detective” here, and on the Universität Siegen website here. This was followed with a presentation at the Conference Dealing with Damage. War and destruction: Museums between loss and remembrance (Krieg und Zerstörung: Museen zwischen Verlust und Erinnerung) on 1 February in Berlin. On February 2 2016, the DGAM released ten new photos of the condition of the Aleppo Citadel and its surroundings. See them here. On January 25 2016 France 24 takes a look inside the city of Aleppo with new video, which can be found here. Drone footage has also been released of the devastation in Homs, Sheikh Miskeen Daraa, Damascus, and the damage to Crak Des Chevaliers. A historic hammam in Aleppo, Hammam Salahiyyeh, has opened for the first time in 4 years, as reported here by Al-Jazeera (via the Aleppo Project). 71 people were kiled after a car bomb was detonated nearthe shrine of Sayyida Zeinab shrine, grand-daughter of the Prophet – a particularly sacred shrine, as reported on 1 February by the BBC here. Daesh claimed the attack, which was targeted at a military headquarters, but which also encompassed the bus station. On January 28 2016, a newly published paper by Silvia Beltrametti and James V Marrone examines evidence from art auctions to look at how supply and demand for antiquities changes in response to changes in laws. Read it here. Ashleigh Tilley, a Research Assistant, a the Human Security Centre, has written an analysis of looting called ISIS, Blood Antiquities, and the International Black Market, with policy recommendations and summarising other inititatives, available here. The Daily Star reports on Jan 26 on the damages to Syria’s natural heritage (subscription only), available here. 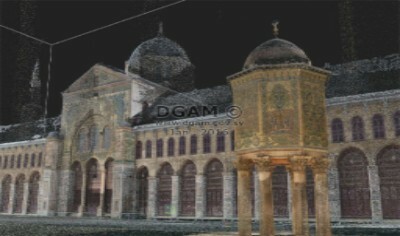 The DGAM, in collaboration with ICONEM, is working on documenting the Umayyad Mosque in Damascus using 3D photogrammetry techniques, the agency announced on January 25 2016. For more information, see here. Buzzfeed reports on a library that has bene built in the ruins of Daraya, in East Damascus. Read it here. A photo exhibition titled “Syria is born again” was opened at Abu Rummaneh Cultural Center in Damascus on Sunday. The exhibition showcases 24 prints by young photographer Ali Baddour, depicting scenes from many Syrian cities (historic and modern) reflecting the destruction, reported here in Sana. Syrian Culture Minister Issam Khalil toured Crac des Chevaliers last week, inspecting the damage caused to the castle due to terrorist attacks, and calling for carrying out studies for the reconstruction of the castle as soon as possible, reported in SANA news here. FutureTense and New America hosted a one hour discussion – Deploying Technology to Rescue the Past – Thursday, January 28, 2016. 06:00 PM – 07:30 PM, featuring ASOR CHI’s Scott Branting, Salam Al Kuntar of the SHOSHI project, and Dr Johnson of the Smithsonian, that can be found here. On 4 Feb, Art News reports on the tribute to Khalad al-Assad by the Museum of Fine Arts in Boston, available here. ASOR Cultural Heritage Initiatives has published its weekly report 67/8 (November 11-24, 2015) here. The presentation of Jesse Casana (Associate Professor, Dartmouth) at the ASOR Cultural Heritage Initiatives Symposium in Atlanta is now available on Youtube. It is titled “Using Satellites to Connect the Dots: Looted Antiquities, ISIL, and the Syrian Civil War” and can be found here. The American Committee on Foreign Relations passed a measure that gives the federal government the authority to impose import restrictions on Syrian antiquities, waiving the provisions of current law that require a request from the country of origin, intending to restrict Deash’s income from antiquities sales, reported here. In a lecture that is available here online, Professor Roger O’Keefe examines how international law can protect historical sites and antiquities in Syria and other war zones. A Panel discussion was held on 26 January titled The Destruction of World Heritage Sites as It Concerns Cultural Property and International Laws. A description of the discussion is available on the Centre for Art Law website here. In a particularly interesting article, on January 26 2016 Slate looks at the use of social media as a way to predict threats to heritage sites here. On January 28, Guernica takes a thoughtful look at looting, its processes, and its impact on identity, available here. On January 25 2016 The National Interest takes a look at the motives behind Daesh’s destruction of culture here. A news brief from Ekathimerini.com on January 24 2016 asks if Greece is a transit point for stolen goods from Syria and Iraq here. On 5 February, Counterpunch discusses the looting by Daesh, available here, and reprinted in Distant voice here. Iran Urges UNESCO Push to Protect Cultural Heritage in Syria, Iraq (January 28), available here. U.S. Museums May Serve As Safe Havens to protect ISIS-Looted Antiquities from Destruction according to the Centre for Art Law who are examining the implications for the new Safehaven protocols developed by the AAMD, reported here. On 25 January the Daily Mail shows before and after pictures of damage to Syria’s sites, available here.